This week, I noticed a 27 November 2017 Big Think article, called "Your Identity Is Almost Entirely Based on Unconscious Brain Processes". 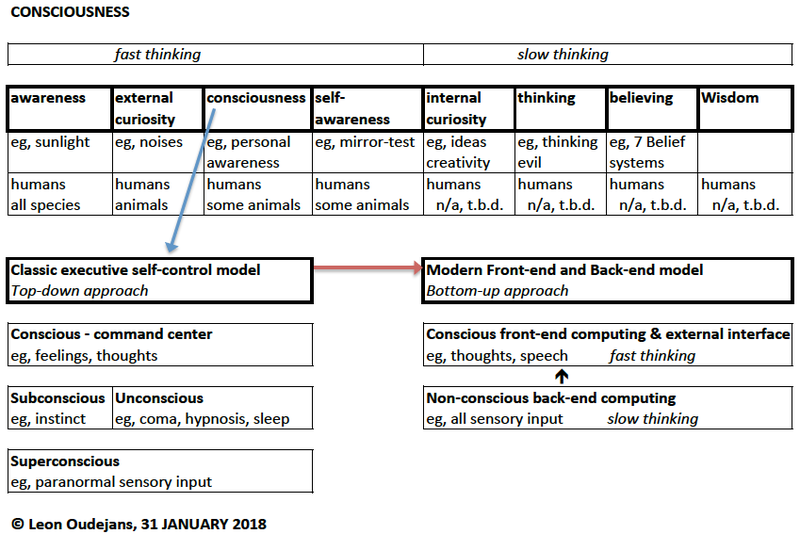 The classic executive self-control (top-down) model on human consciousness is replaced by a new front-end / back-end (bottom-up) model. The distinction between conscious, subconscious, unconscious, and superconscious is replaced by a simple separation between a conscious front-end and a (continuous) non-conscious back-end processing. The distinction between fast and slow thinking appears to remain valid. These words might be difficult. 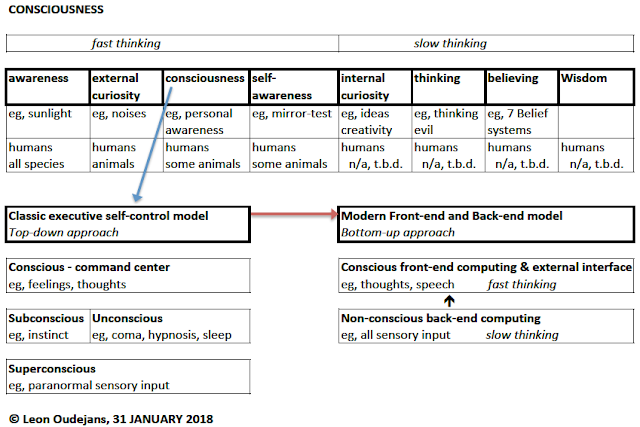 Hence, I made a diagram to illustrate the old and new concepts of consciousness. I also put consciousness into a wider perspective as it's only 1 of the 8 states of mind. 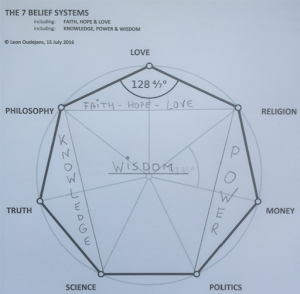 Everything starts with Awareness (my blogs) and "ends" with Wisdom (my blogs). Frontiers in Psychology (2017-11): "Consequently, it is the capacity to communicate to others the contents of the personal narrative that confers an evolutionary advantage—not the experience of consciousness (personal awareness) itself." Hence, language (my blogs) is the external interface in the new model.